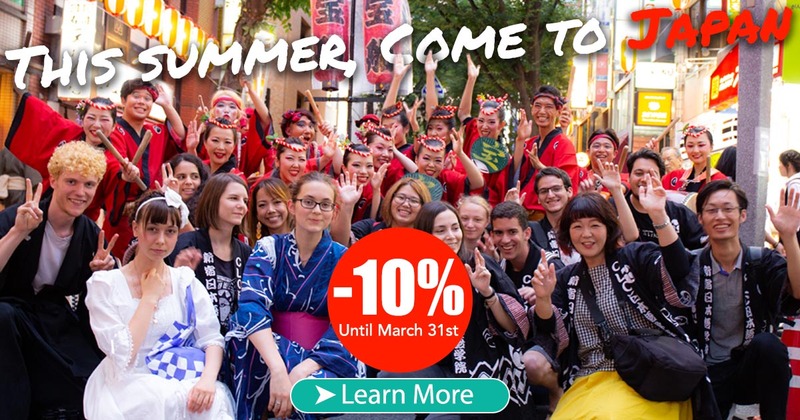 Registration for SNG Summer Course is open and to celebrate the beginning of the 2019 season, SNG gives you an exceptional early bird discount of 10% on any application for the Summer Course submitted before March 31st, 2019. Take advantage of this offer immediately and visit the SNG Summer Course website! The SNG Summer Course in Japan is a 4-week program in Tokyo, which includes Japanese classes every morning. We offer an introductory course for beginners and seven different course levels for experienced students. In the afternoon you will visit various famous places in Tokyo, and also go on a trip to Kamakura and Okutama. Enjoy a night cruise in the Tokyo Bay, participate in the traditional festival of Bon Odori and explore Tokyo in your free time! The SNG Summer Course is an unique experience. Prepare yourself to go on a perfect adventure, as well as to find new friends from Japan and all around the world! For more information, the prices and the detailed program, visit our SNG Summer Course in Japan website. Next post: How to obtain a student visa for Japan?